Modern Shanghai: a global city in the midst of a renaissance, where dreamers arrive each day to partake in a mad torrent of capital, ideas, and opportunity. Marketplace’s Rob Schmitz is one of them. He immerses himself in his neighborhood, forging deep relationships with ordinary people who see in the city’s sleek skyline a brighter future, and a chance to rewrite their destinies. There’s Zhao, whose path from factory floor to shopkeeper is sidetracked by her desperate measures to ensure a better future for her sons. Down the street lives Auntie Fu, a fervent capitalist forever trying to improve herself with religion and get-rich-quick schemes while keeping her skeptical husband at bay. Up a flight of stairs, musician and cafe owner CK sets up shop to attract young dreamers like himself but learns he’s searching for something more. 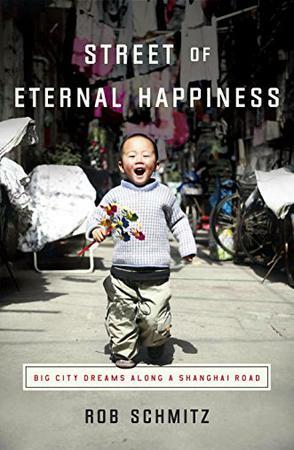 A tale of twenty-first-century China, Street of Eternal Happiness profiles China’s distinct generations through multifaceted characters who illuminate an enlightening, humorous, and at times heartrending journey along the winding road to the Chinese Dream. Rob Schmitz is the China correspondent for American Public Media’s Marketplace. He has won several awards for his reporting on China, including two national Edward R. Murrow Awards and an Education Writers Association Award. His work was also a finalist for the 2012 Investigative Reporters and Editors Award. Paul Boehmer is a seasoned actor who has appeared on Broadway, film, and television, including The Thomas Crown Affair and All My Children. Coinciding with another of his passions, sci-fi, Paul has been cast in various roles in many episodes of Star Trek. –This text refers to the Audio CD edition.